“The investor’s chief problem—and even his worst enemy—is likely to be himself”. We just published with MIT a great research showing that the wisdom of the crowds beats the markets. If you believe that it is impossible to beat the markets and make money through trading, you’re not alone. You can easily find many individuals who have tried their hand at the markets and lost, very likely some people you know. Regulators have found that more than 9 out of 10 traders lose money, according to the New York Times. 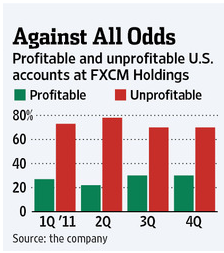 The Wall Street Journal reported in March that in each quarter of 2011 more than 70% of individual trading accounts did not generate profits at FXCM, a large foreign exchange broker. He believes that even so-called professional traders making decisions with conviction are really just rolling the dice in competing against the markets. Barber and Odean believe that overconfidence leads traders to trade larger volumes in the financial markets, implying that overconfident traders see their analysis of market information as highly accurate, beyond reality. Their evidence leads to the conclusion that overconfidence allows traders to believe in their abilitiesdespite the data against them. I believe that social trading will revolutionize this scenario: the wisdom of the crowd will allow traders to beat the market. More significant than my own declarations, research from the Massachusetts Institute of Technology (MIT) Media Lab proves that individual traders who trade using eToro’s Copy Trader earn on average 4% more than on their own. With guidance on which Guru traders to copy on the OpenBook, tuning the social network, traders earn 6-10% more than trading independently. I am very excited to share this great research thanks to Dr. Yaniv Altshuler at MIT, and encourage you to read more about the study here.